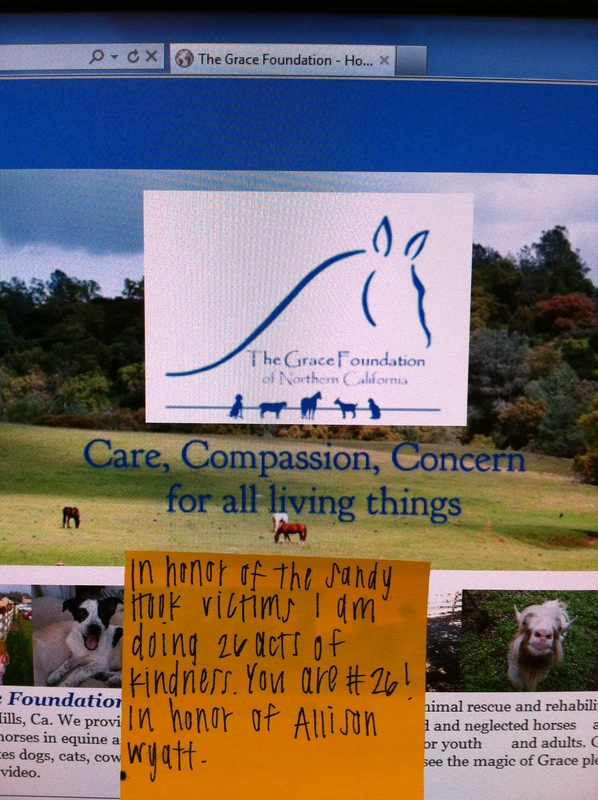 Random act #26 is one that is very near and dear to my heart and combines both my love for horses and my wish to do some little bit of good in the world. Many of the children killed at Sandy Hook had a love for animals, so I think this one is really a great deed. I hold a special place in my heart for animals who, like children, cannot defend themselves. It breaks my heart to see the terrible things people do to animals. My own Shadow was neglected, as was my sister’s Lilah and both have shown nothing but love for us and our families. Grace also offers programs for people of all ages that are struggling with autism and other physical and emotional challenges, as well as a variety of youth leadership programs and life science classes. Sadly, the Grace Foundation had to close its doors to the public this last October due to an ongoing battle with the banks over funding. They are working to reopen their doors on February 1st but need the help of the public. I donated $26 to the Grace Foundation in honor of the Sandy Hook victims to try in some small way to help these animals. Click here to make a donation of your own – any amount helps and it all adds up! Please share this with your friends, family, and coworkers. This is one of those truly selfless causes and your money goes directly to the care of the horses and upkeep of the ranch. And just like that, my 26 random acts of kindness are done. I’ll post a recap in the next couple of days with some reflections along with what I’m doing going forward. Stay tuned!